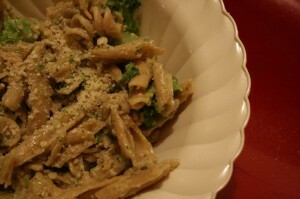 Pasta with Cheese & Broccoli - Kosher In The Kitch! Pasta with Cheese & Broccoli - Kosher In The Kitch! This is a recipe my friend Faigy gave to me back in high school. We would always make it on lazy sundays and when studying for finals because it was easy to prepare and tasted great. Now that I am “grown up” and more health conscious, I use whole wheat or whole grain pasta. However it can still be prepared in a hurry and has the same great flavor! Cook the broccoli in a pot. Once the Pasta & Broccoli are ready, mix together with the Mozzarella cheese. Add the Parmesan when serving. I make this also, but slightly differeently. I add this into a bowl with about 1 TBS of canola oil, 2 tsp garlic powder and 2 tsp salt. This is a great quick supper though!